Stan Howe was born in Oak Lane in 1926, and I had two sisters. First of all, I’d like to start by giving you a guided “tour” round the village, how I remember it as a boy (late 1930’s). Starting from Grove Lane going towards the village centre, on the opposite side of the road was what they called the Bat Factory (now Lyle Close) where they used to make cricket bats and where they used to get all the willow, drying it out and then make bats. After the bat factory closed, John Rannochs took it over, and later still it became Tate & Lyle’s. Then we came up to Oak Lane where there was a pub on the left called The Oak, and to old Mr Ball’s garage where petrol cost 3s 4d per gallon then. I was about 16 so that must have been in about 1942-3, and I used to work the old petrol pumps on the forecourt. Travelling down Ashfield Road a little further, there were two farms (both owned by Borley’s) where they’d done all the filming down there (more of that later), and on the left-hand side was White House Farm, where my father worked for many years. He was a horseman there, and his wages then were 21s per week. Next on the right, we had Dyball’s Willow Farm, and further down this farm there used to be a horse slaughterer called Jim George. They used to slaughter all the horses, and Mr Sykes used to bring the horses to the slaughter-house, deceased or otherwise, and they used to make glue. From there on the opposite side of the road was the Sanitary Inspector, Mr Wyatt, who used to go round the village sorting out all the stuff. A little further along Ashfield Road, we came to some houses, one of which was the Elmswell Police Station, before we got to the Baptist Chapel where I used to go to Sunday School. Next to the chapel, we had a shop called Horrie Faires, then we came to Nunns where Mr Nunn used to do all agricultural stuff during the time that he was there, and he was the first man in Elmswell to drive a car. He also used to do a lot of horse work in there, horse shoes and everything, and I used to bring horses down to be shod from White House Farm. From there on, on the opposite side of the road was the shoemaker and cobbler, and then on to the Bacon Factory where there used to be a lot of pigs going in and out. Further on to the left, was Mr Godbold’s Street Farm before we get to the village, then across the road we came to a shop (now the Mace). Then there was The Lion pub which used to hold lots of events such as circuses and fairs during the time I was a boy. Next we had Jacob’s fish shop, and then opposite that was the Registrar for all the old people who lived in the village, and from where they took all the dole money in the various times. We also had a dentist, Sanderson’s, behind where Margaret’s the hairdresser’s is now. Then we had another garage called Jacob’s Garage, then the Fox Inn (by the railway station) where people used to bring up the old horses, tie them up, and spend the night if they wanted. I remember in The Fox’s yard, Greene King had their brass-funnelled steam-powered fire engine, at the time when the firemen wore brass helmets. Opposite that we still had the old coal yard, Jewers on the same side before we get to the station, as well as Pye’s Timber Yard and also the Railway Goods Yard. Then beyond the railway, we came to another garage called Albatross where they made a plane called The Flying Flea which actually flew (more of that later). On that same side, down the drive, was another pub called The Crown, then on the right we had a little shop called Farmer’s (next to where the vet is now), but before that Jewers had another place called The Granary. By the railway station’s Booking Office, there used to be a small kiosk which sold sweets and newspapers. Further down on the same side we had The Bank House and the big Mill. Over the other side of the road we had the Post Office and several butcher’s shops. Then round the corner (into School Road) we had Hawk End Lane with its little sweet shop called Elliston’s, after which we had Miller’s Transport down Rose Lane, and then Davison’s shop on the corner of (what is now) Pightle Close, opposite which was the Bakery called Rand’s of Thurston where they used to bake the bread and cakes. Opposite that we had The Railway Tavern pub, and then on towards the old school where I used to go, as did my father. Then we had Penny (now Parnell) Lane on the sharp corner where there was a farm down there which we used to visit. Half way down that lane there’s a river, on the left of which there was a little bridge, water going underneath (which we used to call ‘the pond’) and opposite the bridge were some elm trees, and that’s where Elmswell got its name. Sadly, these trees were cut down, but this was many years before the Dutch Elm disease ever got around. Carrying on along School Road going up the hill, the church was on the right, with the old people’s home (Almshouses), two each for Elmswell and Woolpit. Then down the hill from the church (down Bunker’s Hill) my grandmother had a thatched cottage where she had eight sons and one daughter. Continuing up the road we had Bunker’s Hill Farm run by Woolnough’s. Then round the corner up the Norton Road, we had another pub called The Fox & Goose, and another farm, Elmswell New Hall, on the right where they say the King lodged many many years ago, this being where the present-day Stud Farm is. Returning down and up Bunker’s Hill, we had the old Rectory on the right (virtually opposite the church); the new Rectory is a little further on now. We used to play football on the meadow there called The Park. Further on down to the corner (Church Road/present-day roundabout), there was a well in the garden there, a big hole in the ground, where we used to walk along underground (I believe it was a Roman tunnel) which used to lead all the way to Haughley Church. We used to light a candle to walk along this underground tunnel, but we had to come back when the candle went out. As we came further round the corner (into present-day New Road), on the left we had Jewers granaries and Hoods Farm which was a farm many many years ago which John Rannochs took over. On the right was Wrights electrical shop where they sold and repaired televisions, and they produced a lot when the Queen took to the throne. On the next corner (Cooks Road) there was The Grange on the left-hand side which was a big farm and house, and then on the opposite corner was Jim Mulley’s undertaker’s place (now “The Willows”). He used to use the funeral bier when somebody died, wheel it up to the church, then to the cemetery. Next on the right we had the old Village Hall (now the Library), then onwards on the same side were Hawes the printers, from where a little further (at the end of Prescott Drive) was a Barber’s shop which was run by a German called Mr Kay. A little further on Wetherden Road, there was a bloke called Clem Hardigan who used to do all the harness-making for the horses, and he used to ring the church bells. Sadly, it’s years and years since the church bells have been rung, but I reckon they’re now too far gone, although I think they’re still in the tower. Going back to my school days, I used to have to walk from Oak Lane to school four times a day in all weathers. I used to work on the farms during the school holidays although we never had proper holidays in our time, and I used to help my father with the horses, but he had to harness them as I wasn’t big enough to reach then. I used to go horse raking, harrowing behind the drills and, after that, when the engine came to thrash the corn, I used to have to go down to the mill to take the corn, wheat, barley or oats on a tumbril lorry and back. When I was a little older, about 17 or 18, I used to go down to the little shop and get whatever they wanted. Like everybody else in those days, I left school at 14, and was in the Air Training Corps (ATC) when I was 15. I served in the ATC for two years, then volunteered for the Royal Navy when I was 17. 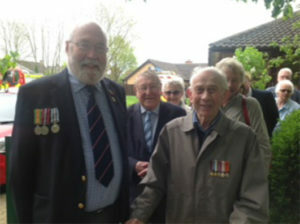 I was abroad for two-and-a-half years non-stop from 1943-6 with the Navy and, from there on, I did 32 years in the Fire Service in Elmswell. With the Navy I went to Ipswich, then to HMS Ganges (Shotley) where I was for 12-14 weeks, then down to Gravesend, then shipped out over to Belfast. After that we were going to the Far East, but first of all we were going onto the Russian convoys, but they turned that down because the ship wasn’t ready to sail with the convoy, so we got out of that one! So then we were sent to the Far East, with three ships – “The Nelson”, “The Sussex”, and “The Anson” – but we got as far as Suez and they turned us back, as they were loading so many destroyers in the Med. I was on “The Jarvis” (with a crew of 200) for one-and-a-half years, and then after the war we were going to come home but they still left us out there (this would have been 1946), and I was put on a mine-sweeper, “The Providence”, for another year. We did a lot of mine-sweeping off north Africa (Tripoli, Benghazi, and Bizerte); we were out for a fortnight, came back for a week to provision up, then back out again. We were sweeping mines from 5am until 10pm, so we didn’t get a lot of sleep, although we did when we got back in. Although there were no other Elmswell boys with me at this time in the Navy, there were some from Stowmarket. 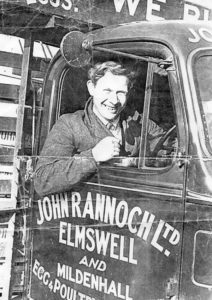 I came home in about June 1947, when I went to work on the railway in Stowmarket, and from there I was made Horse Shunter at Elmswell. We used to take all the business to and from the Bacon Factory, and it was also very busy round the station coal yards, where there were horses and Jewers. There were six pubs and eight shops in the village all together at that time, as well as three butcher’s shops. Then I became redundant working with the station horses because they wanted to shunt all the trucks with engines (not horses) for which they had special people there, so I walked across the road to see Reckitt & Colman where they made semolina, flour and bran in Elmswell. Reckitt & Colman took all their stuff out of Norwich during the war, making the semolina factory at Elmswell, and the mustard factory at Needham Market. Then when Reckitt & Colman decided they would return to Norwich, they asked me if I would like to go with them, but I said “no” because I didn’t want to go to Norwich every day of the week as I had no transport to take me there. 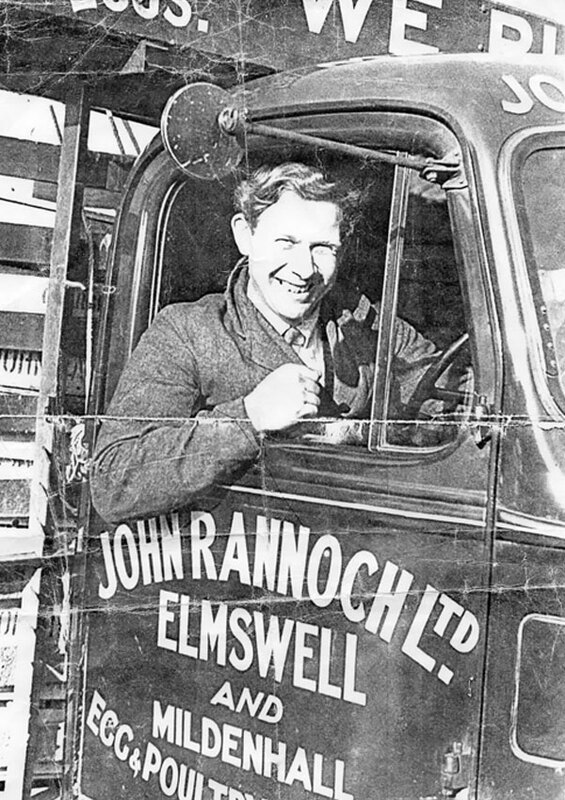 Stan Howe Working for John RannochSo, I walked up the road and asked John Rannochs if they had any jobs going, who said “when would you like to start?” to which I replied “Monday if you like”, which I duly did and I stayed there for 40-odd years. Rannochs was not where Loch Rannoch Close is now but at Hoods Farm (New Road) where they operated from, before they went to Haughley Park. Going back to the filming which I mentioned earlier, that was the 1980’s television series “Lovejoy” about the antique dealer filmed at a house (now Mulberry Farm) up Ashfield Road. The chap in the village used to do the motorbikes which Lovejoy used. I used to play darts with the actor Ian McShane in The Railway Tavern – he and his mate challenged my mate and I to a darts match, and we lost the first game but won the second two. McShane’s mate offered to buy us drinks, but Ian insisted that he himself would buy us a drink! The television cast and crew were all quite friendly to have a beer with after the filming. They did all the filming in one of the old sheds down there, but I’m afraid I never appeared in any of the films, although it was an exciting time for the village. Of course, during the War there were all the Americans round here then and there wasn’t a girl to be seen! The Americans tended mainly to gather at The Fox, although they did visit The Tavern too. I did fly from Ashfield airfield with the Americans in a B17. To explain – as I said earlier, I was in the ATC, and Mr Blaker who kept The Fox was the man in charge of us as our Commanding Officer, so getting all the whisky into them, he asked the Americans if we could have a flight, to which they agreed. That was during the war, and we went out, and we had to man half the aircraft because we were on the guns, and we went out for about 90 minutes in the Fortress. We didn’t know where exactly we flew as it was up in the clouds, and all of a sudden there was another plane coming underneath us! The American pilot said “Goddamn, that’s a near miss!” as he was sitting there smoking his Camel cigarette! We landed safely anyway, but it was quite an experience. The Americans went to drink all over the place including Gt Ashfield, Bury, and Stowmarket, travelling in their Land Rovers and Jeeps, and had much more money than our folks did. When they wanted to go to London, they’d all wait at Elmswell station, three or four deep on the platform, never seen so many people at the station. During the war, there were a lot of tanks came off this station, then going up the Ashfield Road to the airfield. If you went up to Haughley Park up the back road, and just before you got to Haughley there’s the woods up there, the British soldiers were all scattered in Haughley Park in tents underneath and amongst the trees. It is true that the black and white American servicemen were segregated, the black men stayed under canvas in Tostock. My father was in the First World War; there were eight of them who went to that war, and two of them (George and Charlie) never came back. My father was captured on the Somme, and he had three years in a Prisoner of War camp. Like a lot of people then, he didn’t want to talk about his war time experiences. I never heard anyone talk about villagers who worked up at Elmswell’s WW1 aerodrome, the Royal Flying Corps up there then. There may have been village women working up there then but not to my knowledge. In WW2 he was in the Home Guard as well, starting as sergeant but then made up to lieutenant. The Flying Flea mentioned earlier was a little aeroplane made by Albatross, who were the aerobatics people. They made this little Flying Flea all out of plywood with lots of little wires here and there, and a small engine on the front, then a chap from Elmswell piloted the plane. They took off but somehow it crashed at the finish, but it did definitely fly from a local meadow. During the war there was a ridge down Penny Lane (leading to Mr Kirkwood’s Elmswell Hall), there was a plane came down in that field and they had to change all the engine round using tripods (to take the engine out and put it back in again) and then it flew off that field. Most of the people I went to school with are now dead, but I can remember Terence Buckle who was in the Air Force, and my other mate was also in the Navy but he got killed, and all the other boys got scattered all over the place and they didn’t all come back. There were some boys over here who went into the Territorial Army at Stowmarket and they all went into the Army, going over to the Far East and they all got captured. There was George Bruce that I remember. Just like we hear about all the immigrants who are coming over now, we had that in 1946. We used to have to board these ships at 5am, take them into Haifa because the ships were overloaded – some had 300, 800 or even 1,800 on board; you never knew how many there’d be! We had to get them into Haifa harbour, disembark them there, strip them off and wash them all down with hoses, because you know what sort of state they’d been in having been there a fortnight without moving. After that, we had to DDT (disinfect) them all over, and then the Red Cross used to put all fresh clothes on them. These were Jews (Stan has some photos of some of these people who he picked up out of the sea) who started off in Italy, and then we had to take them back to Famagusta in Cyprus to the concentration camps. That was when Archbishop Makarios (1913-1977) was President of Cyprus. I had hepatitis and was in a Greek hospital for three weeks, where they didn’t give us a lot to eat – all we had was fish and sweets. I also had a bout of prickly heat, after which the English summer heat never bothered me again. After the war, I met my wife, Evelyn Joyce Laughlin, in 1950 and we were married in Needham Market in March 1952 (she passed away in 2012). I’d met her at Needham station when I was coming home from the Hippodrome. She worked at the Co-Op, and she was at the station with my mate and his girlfriend. I just said to her “what about tomorrow night”, she said “yes”, and that blossomed from there and we never looked back. In fact, we were together for 62 years. My wife was in the Needham school which was bombed, where Rev Hargrave Thomas was. That particular time, they were in the field potato picking, and they’d seen this bomber come over which hit and killed two people. The first bomb hit right at the bottom of the High Street, where the garage was, where the Post Office was, so the bomb demolished the Post Office and the two people in it. The second bomb went over, hit the fencing at the other school and bounced back. Other than those places already mentioned while in the Navy, Stan visited Malta, Lisbon, Gibraltar, Alexandria, Beirut, Rhodes, Algiers, Trieste, Venice, Sicily, Crete, and Jerusalem (the old and new city, including the Church of the Holy Sepulchre and Garden Tomb). He has a pressed-flowers card from The Holy Land which he sent to his mother with a letter, but he wasn’t allowed to sign the card because the censors were very strict on this sort of information. He also showed us a Maltese six-penny note (not coin), marked ‘6d’ (old pence). 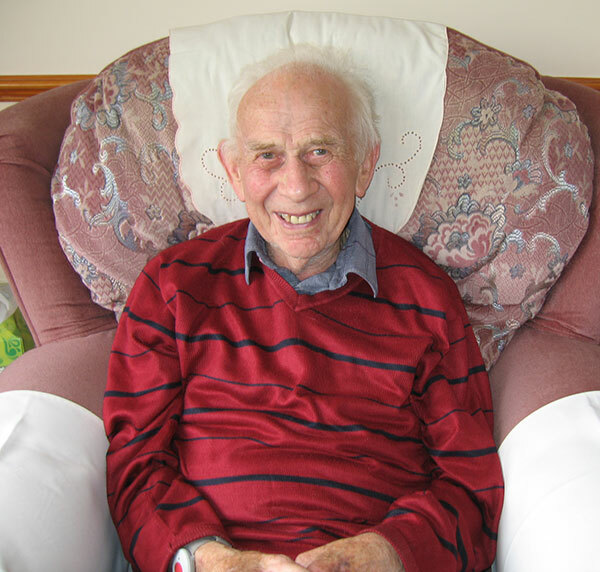 Stan returned to Malta in 2014, 70 years from when he was last there, and was treated very well by the British Airways crew and hotel staff. 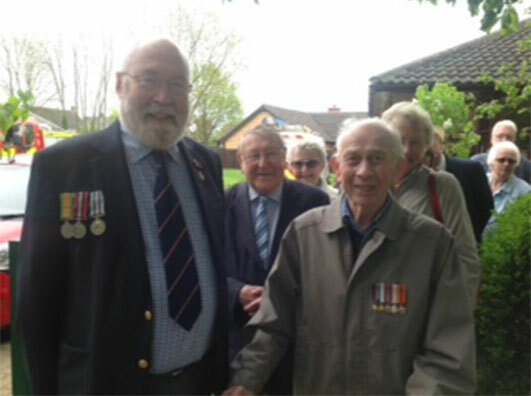 Stan says he loved his time in the Navy, and is very proud that his grandson is now a Petty Officer and aircraft controller in the Navy, stationed in Yeovil.